Two different types of power come together with this volatile couple. Aries’ explosive initiative will battle it out with Scorpio’s buried intensity. However, both signs are after the same thing: brutal honesty. Sun in Aries is as straightforward as they come. He has no time for games as he barrels along the most direct route from A to B. Intolerant of weakness, he respects those who match his blunt force with their own. 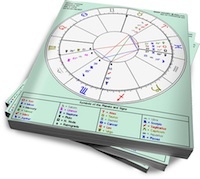 This includes his partner; Sun in Aries needs a lover who will push back. His goal is to develop courage and this can only be done when he is tested. If his relationship becomes mellow, he’ll stir things up or leave. Moon in Scorpio needs emotional honesty. She is not truly comfortable until her partner engages in raw, uncensored intimacy with her. But not right away. She’s guarded and it takes a while to win her trust. Manipulative behavior is just Scorpio’s way of ensuring her lover is worthy of her trust. Once that trust is earned, Moon in Scorpio will be an emotional rock. But no matter how well the relationship is going, Scorpio will periodically withdraw. Her partner must honor this need to regenerate or risk provoking Moon in Scorpio’s hidden temper. Sun in Aries will have little tolerance for Scorpio’s slow, emotional reveal. And Moon in Scorpio will find Aries’ bluntness threatening and irritating. But if they stick together long enough, each will come to respect the others’ strength. And they will discover that honesty is their common goal. Moon in Scorpio’s unwavering support will back Sun in Aries’ quests for excitement. She’ll keep him challenged (to put it mildly) when he stumbles over her boundaries and triggers volcanic anger. And Aries’ blood and guts approach will satisfy Scorpio’s craving for undiluted passion. Whether they can tolerate the inevitable battles between them will depend on other planets in their charts. But they will certainly keep each other passionately engaged. I think this is all very true. I’m an Aries Sun, and I dated a man who was a double Scorpio (sun and moon both in Scorp). The thing is, most people born in the 60s also have Neptune in Scorpio, so for this group with Moon in Scorp there’s always going to be a strong Neptunian influence. There sure was for him! So, on top of what you already said, he was a complete martyr most of the time. Setting boundaries with other people was completely impossible for him. Which is weird for a Scorpio. He would do anything for anyone at anytime. What about the opposite? Sun scorpio and moon aries. Would it be similar?